I read this book a long while ago. It moved me then and still moves me today when I consider the sacrifice and choices involved. There are no spoilers in this book – you know Adam is going to die from page one – but it doesn’t really make it easier to swallow. And it all came flooding back when I finally watched LONE SURVIVOR the other day – a movie that details a similar mission referenced in FEARLESS. Let’s back up for a second, though. 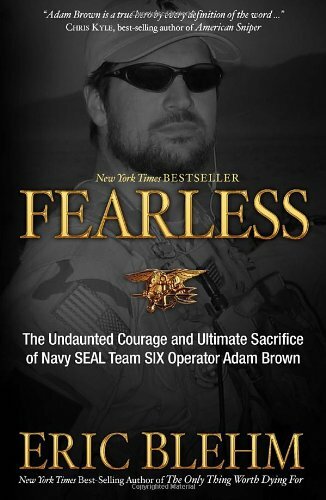 FEARLESS is the story of Adam Brown, a troubled young man who struggled to find his place in the world before cleaning up his act, becoming a Navy SEAL, and sacrificing everything for his country. Everything you could expect. Nothing like you would expect. Heartwarming and heart breaking. Stirs up feelings of admiration and pride. A story of redemption and many questions of why. This is definitely a book worth reading that will help you understand the people who risk their lives for the safety of others (including us). It’s a pretty captivating read and will certainly change the way you look at life.